the Creative Team at Rakis on Collins decided this years Spring campaign needed to be something breathtakingly bold and beautiful (could you really expect anything less from us?). So, what could be more fitting for a special Spring collab than joining creative forces with none other than Melbourne’s infamous floral designer, Mr Ross Jenkins, affectionately known as Bloom Boy for his extravagant, one of a kind creations and boundary pushing shoots and calling on long term Rakis client and model, the beautiful Juliette Elle to bring the whole creation together. 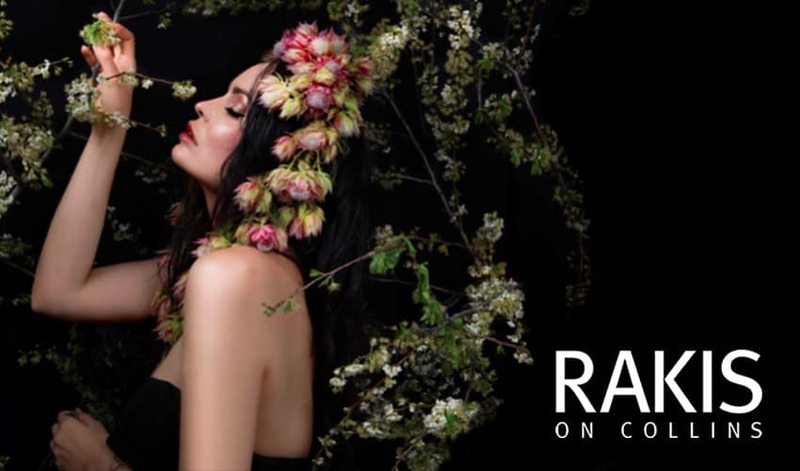 We think it’s safe to say the result was a phenomenal shoot for Rakis’ Spring / Summer campaign, which has now been dubbed ‘A floral fantasy’ and we can certainly see why. Inspired by a unique blossom backdrop, Creative Directors, Danny Puopolo and Chris Geracitano, along with Senior Stylist and Colourist Pasquale Porciello, effortlessly pulled together an incredible look. The team were inspired by the season and all of the surrounding blooms which set the mood and created a vibe which captured “the awakening of the life and new growth that happens at the start of Spring” – Bloom Boy. The result? A creation of a breathtaking floral fantasy, making it one of our favourite campaign shoots yet! Starting with an already perfect canvas (Juliette’s naturally luscious hair! ), Danny worked to enhance her natural curl texture. This is a huge trend in the industry right now and the go-to look for this Spring/Summer. To achieve this look you need to think ‘luxe simplicity’ – smooth textured waves that work with your natural style to create a summery yet glamorous look. Danny prepped Juliette’s hair using Shu Uemura’s Kaze Wave Mousse and layered Shu Uemura’s Wonder Worker onto scrunch dried locks before he tonged Juliette’s hair and finished it off by using the Dyson diffuser to complete the whole look. Now in case you didn’t know, we all wear our invisible crowns daily to channel our inner queen at Rakis on Collins, but for this shoot we relied on the creative eye of Bloom Boy, we knew this floral crown was never going to be a mere simple garland because he’s renowned for original and bespoke creations. …And boy did Bloom Boy deliver! He designed a floral masterpiece, consisting of delicate seasonal Blushing Brides to create a loose style crown that not only complimented the styling of the hair with its flowing design but added a texture creating a more organic and effortless look. “I particularly like how the unstructured shape of the crown mingles with the disheveled texture of the hair” – Bloom Boy. The whole look was perfected with a touch of artist by our multi-talented Creative Director, makeup artist and photographer Chris, who brought all of the different elements of this exquisite look together with a colour palette that naturally mirrored the feathery tufts of the florals with subtle hints of pinks and reds which highlighted Juliette’s naturally beautiful features. Completing the look, the creative team chose to style Juliette in a subtle yet glamorous wardrobe by UK fashion designer Karen Millen perfectly complimenting the overall feel of the shoot without distracting from the ‘mane’ attraction.